Brian Richards is an experienced nightclub and event DJ. He has worked at popular nightclubs, lounges and private events throughout New Jersey and New York. His work has been featured on internet radio stations and on NYC radio station Z100's morning show. 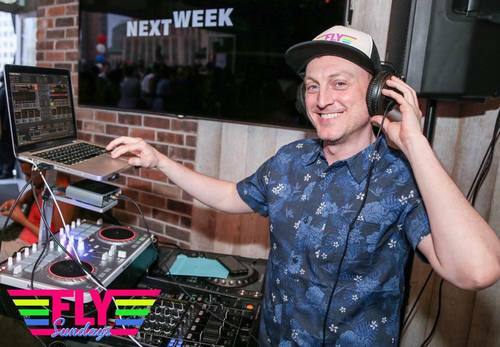 He was a regular DJ in the summer of 2012 at the popular nightclub "Paradise" in Asbury Park NJ, and held residency at the popular Hell's Kitchen spot "Posh Bar & Lounge" in NYC hosting "Retro Sundays" from October 2012 to May 2013. With a customized mix of retro hits, today's top 40, and the best dance remixes the industry has to offer, your event is sure to stand out with Brian entertaining your guests. Currently, Brian is a regular guest DJ for popular clubs and bars in NJ and NYC such as Hardware, Rockbar, Phoenix, The Den Nightclub, The Ritz, Icon Astoria, Stairs Bar, Swag Lounge, Atlas Social Club and VodkaSoda/Bottoms up to name a few, and joined the regular line up of popular DJ's spinning on Fire Island Pines in the Summer of 2014. Most recently, Brian has been working on gigs in NYC every weekend and was added to the weekly line-up at the popular "Fly Sundays" at the Monarch rooftop in the Summer of 2016. His monthly "Tyme Machine @Ty's" in the West Village is a hit as well as other events. I like a wide range of music. I like to start out the night with a few new or obscure tracks, then hit the crowd with dance and party hits all night and keep them dancing. I am a very musical person. It is truly who I am. When I was 7 years old, I brought my portable record player to school for the class Halloween party and asked the teacher if I could play "Monster Mash." She agreed and I loved watching all the kids dance around in their costumes. It was a thrill like no other. That was my first gig! The folks who love the music I play love life. They go out to have fun and let loose. They are familiar with pop culture and love the latest hits, and also love the throw-backs of the 80's, 90's and up. Sing-along pop music from the 80's to today. I never liked that question because I love so many songs and so many different types and styles there is no way to have any favorites. I've had favorite songs through-out my life at different times, depending on the mood and situation. My all time favorites are ones that get the crowd moving, that surprise me when they "feel it" the same way I do. I am not really a festival DJ so N/A. I am sure I would enjoy them but I have never been. I love spontaneity. People gathering around in a circle to dance to a certain track, or singing along all in unison. I like to get the microphone and let them sing it out if we are having that much fun. A good DJ should be open to the kind of music that you want. They should take the time to talk to you prior to the event and listen. Many times I have heard of people giving a suggested playlist to a DJ before an event, and they find out the DJ maybe played 2 or 3 tracks asked for, and then just played what they wanted anyway. I would be up-front and honest if what the client is asking for is not in my library or I am not familiar with it. They also should understand I have a room full of guests to make happy, so I like to stick to songs that almost everyone can enjoy. I decided to be a serious DJ in 2011 and life has shown me that when you follow your dream and work hard, amazing things really do happen. I have far exceeded my goals that I had when I started and played all over NYC in places I never imagined I would. A career like this can grow if you keep nurturing it and putting in the hard work. For me, I have to be passionate about something like this in order to succeed.